In this solo dining adventure, Gary continues his assault on New York City’s ramen joints with a visit to Midtown’s Totto Ramen. 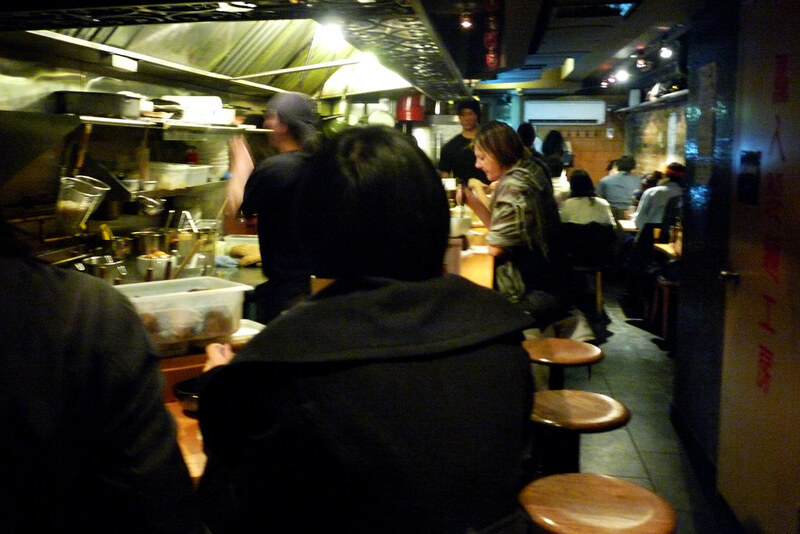 After my experience at Hide-Chan a month earlier, I think it’d be understandable that I would be a little gun shy about visiting another place that purportedly had some of the best ramen in the city. Considering that Hide-Chan was the number one spot on the Serious Eats roundup, I could only wonder how disappointing the rest of the list might be. But this was an anomaly since there was an actual change in the way they did business there and so long as my next target on the list, Totto Ramen, didn’t change things up, I would be golden. After all, other people, my brother included, had already been telling me that it was Totto and not Hide-Chan that had the best ramen in Midtown. Whether these opinions were borne upon before the change at Hide-Chan or not, I don’t know but it was still a boost in ramen consumer confidence. If the throng of people gathered on the outside steps and along the fences of nearby apartment buildings were any indication, it was definitely a popular ramen joint. I try not ascribe quality to popularity but it’s always a good sign when there’s a wait since you’d assume people don’t wait over an hour for crap. Or at least you would hope they don’t. After being seated, I quickly went ahead and ordered the Chicken Paitan Ramen – waiting well over an hour to be seated will leave a fella hungry. Like others have mentioned in the food blogosphere, I was worried that a chicken-based broth wouldn’t nearly be rich enough, not when compared to a pork-based one. Well, if you let the bowl of ramen sit for a minute or so to cool, you’ll see a skin quickly form, putting to rest any doubts you may have that it’s not gonna be fatty or rich enough. It’s thick, salty and flavorful – just an amazingly tasty broth. The noodles are cooked perfectly to the proper chewy density while the pork received a welcome finish at the hands of a blowtorch. In a change of pace, Susan got the Vegetarian Ramen which, if you know her, is funny because she’s one the more ardent meat eaters I know. The broth was vegetarian so it wasn’t nearly as rich as a meat-based one but the mushrooms definitely add plenty of flavor. 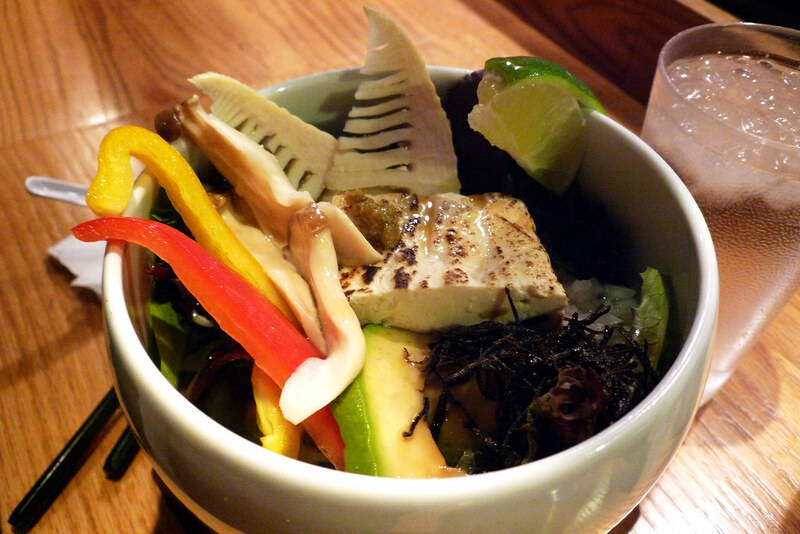 It’s packed with plenty of vegetables and charred tofu so it’s just as filling as their other non-vegetarian ramen bowls. The next time I’m in midtown and have a craving for ramen, I’m not gonna mess around and just go straight to Totto Ramen. They have, by far, the best ramen in the area and even an hour’s wait wouldn’t be enough to deter me. They and Hide-Chan are actually sister restaurants so I have one suggestion I’d like to make to them – perhaps add the black garlic oil option to the Totto menu as well? Please? Well, even if they don’t, their chicken broth is plenty flavorful enough to satisfy even this pork aficionado. 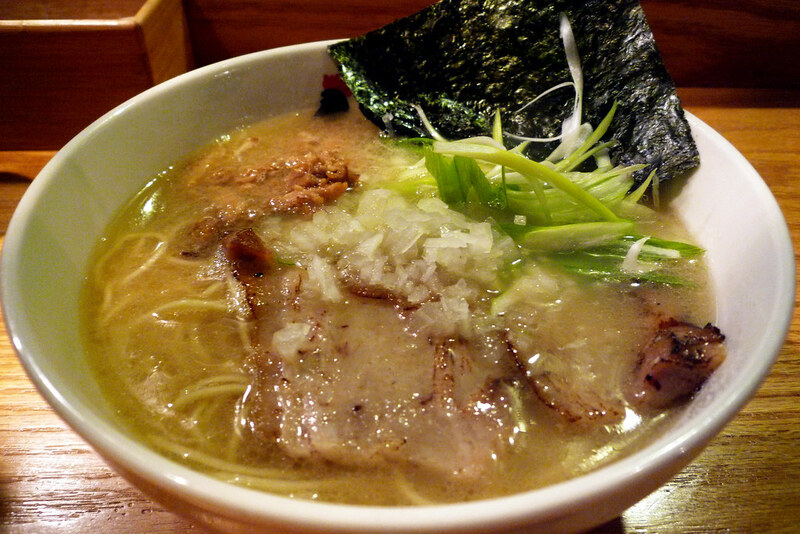 Totto Ramen. 366 West 52nd Street, New York, NY 10019. [Show/Hide Map] (212) 582-0052.